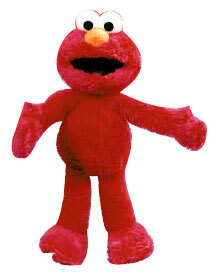 Description Of Item: Elmo is a Muppet on the children's television show Sesame Street. He is a furry red monster with googly eyes and an orange nose. He currently hosts the last full segment on Sesame Street, titled Elmo's World, which is aimed at toddlers. He is accompanied by his goldfish Dorothy, and by silent Charlie Chaplin?like characters named Mr. Noodle, Mr. Noodle's Brother Mr. Noodle, and sometimes, Mr. Noodle's Sister Miss Noodle.